Braille is one of the most precious things available to a visually impaired person, so it must be readily available to all who need it. Anyone who cannot read is clearly at a disadvantage in our modern society, even though they may have many other skills. Consequently, braille is of inestimable value to visually impaired people. It is a great way for blind people to read and write. Braille is a system that enables blind and visually impaired people to read and write through touch. It was devised by Louis Braille in 1821 and consists of raised dots arranged in “cells.” A cell is made up of six dots that fit under the fingertips, arranged in two columns of three dots each. Each cell represents a letter, a word, a combination of letters, a numeral or a punctuation mark. The alphabet, numbers, music notation, and any other symbol that appears in print can be replicated in Braille by arranging combinations of the six dots of the Braille cell. Learning Braille is not that hard especially when the student is young as children have the advantage over adults – they learn more quickly. Children who learn Braille early usually become extremely fast and competent readers. The ability to read braille offers a visually impaired person the opportunity to participate in many different situations, enhancing their quality of life and their contribution to family and work situations alike. 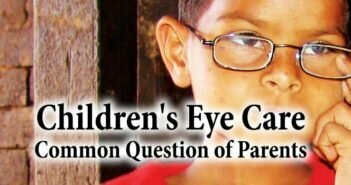 This could range from the ability to read a child a bedtime story, to following the agenda at a meeting (whether on paper or the braille display of a portable computer). When braille was introduced it greatly enhanced the lives of visually impaired people. Braille remains of vital importance to such people. It is therefore essential that those responsible for teaching visually impaired children and those who assist with the rehabilitation of people who loose their sight later in life, fully recognise the unique value of braille and make every effort to teach it to all who do not have sufficient sight to read standard or large print. Learning the Braille code is relatively simple, although it can take a while to train your fingers to sense the dots by touch. The basis of the Braille system is known as the Braille cell. The cell is comprised of six dots numbered in a specific order. Each dot or combination of dots represents a letter of the alphabet and there are 64 different cells not counting the space. The positions are normally numbered starting at the top of the left-hand column as shown opposite. 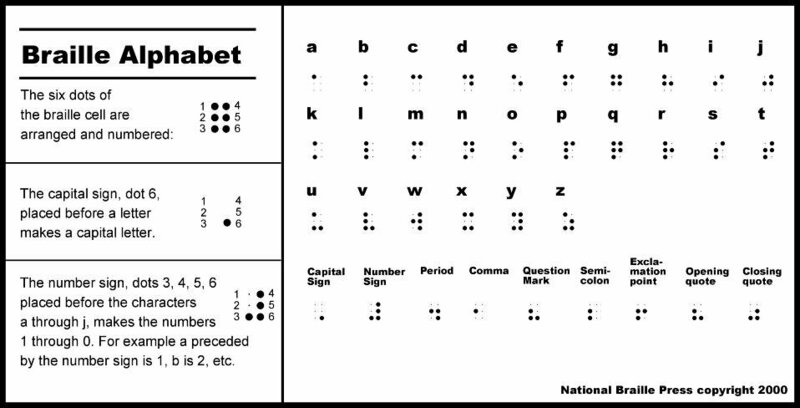 One way to learn the alphabet in literary Braille is to memorise the dot patterns for the first ten letters, a-j. for example dot 1 = a, dot1, 2 = b. Braille Code includes many contractions, which are braille cells that can stand for a combination of letters or entire words. Once the student memorise dots, then he is made to identify the alphabets. Means student has to move his/her fingers on raised dots and find out how many dots are there and what they are called as. When student becomes familiar with these dots and can easily identify the alphabets with the help of raised dots then practice of writing starts. The point to be kept in mind is that in Braille, while reading the left hand cell is of number 1 but at the time of writing it becomes number 4, means just opposite. For example when you will read A = 1 no cell when same thing is written it will be 4 no cell. 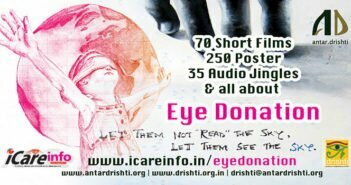 If anybody wants to understand to write the Braille in more easier way, he/she can view it by keeping the Braille alphabets in front of mirror.